“It was another glorious summer at Carver Camp in Grass Lake, Michigan. 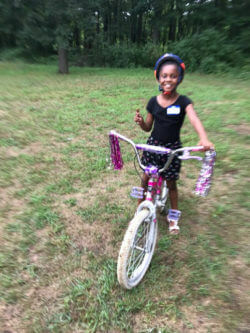 This year, the day camp included arts and crafts, fishing, sports and plenty of bike riding. 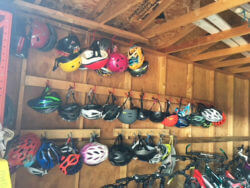 Following completion of our 2018 Bicycle Improvement Project, the camp has 42 bikes and plenty of helmets for the campers to use. With the grant from League of Michigan Bicyclists, we purchased seven beautiful new Treks! 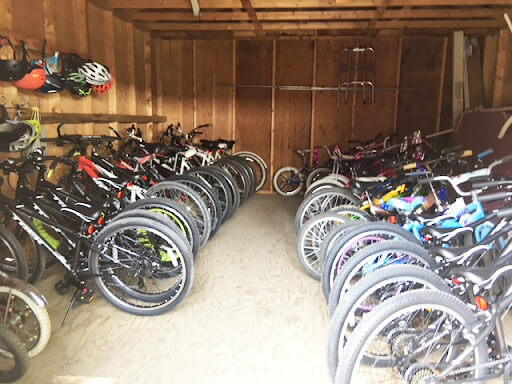 Friends of Carver Camp donated additional bikes, and volunteers fixed them up. After a productive afternoon at Rebicycle Lenawee, four of Carver Camp’s existing bikes were tuned up and ready to ride. The team there also showed the Camp’s volunteers some good tips for working on the grip shifters and V brakes that are common on many of the camp’s bikes. Plus they loaded us up with enough tires and parts to get the camp’s bikes back in action. We need quick release seat clamps to allow easy adjustment, which is on the list to buy for next year. We need more options for teaching first-time bike riders. Our plan for next year includes more training wheels and the addition of push bikes for our youngest and least experienced campers.